Our company also provides Giant Domino. It is made of good quality of teak and polished in brown color. 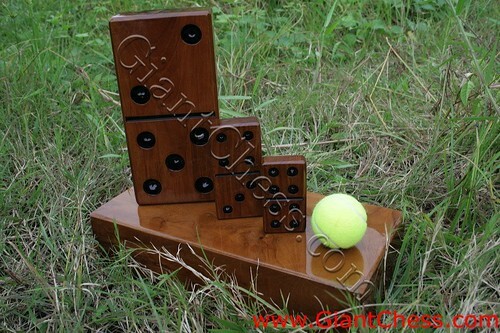 The giant domino can be purchased in a complete set or single piece. You may order your favorite giant domino to us. Very attractive for your guest when they visit you and find this kind of giant domino at your living room as house decoration. Wooden giant domino polished in brown or natural wood color and add with black point is highly recommended for decoration. You can creatively put this domino in your bookcase, side of the room or anywhere in your best spot. When you feel like want to re-decorate your place or fall in love with unique art design, you might want to try this idea! You can make up your house and add it with some unique touch by put this wooden giant domino as your house decoration.